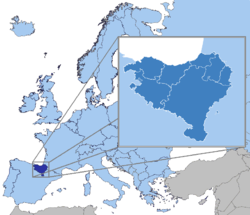 Basque Wikimedians User Group — official name, in Basque: Euskal Wikilarien Kultura Elkartea or EWKE — is a group formed by active members of Basque Wikimedia projects who are interested in organizing and participating in outreach activities on a Basque Country level. Members of the current user group have been active for several years now, engaging in activities that include workshops, edit-a-thons, townpedias, and other education related events. --Luistxo Fernandez, a member since 2018.01.